Livingston Caterers knows a thing or two about throwing a good party. What your guests will remember the most about your event are the food and the entertainment. Luckily, we are experts in both. We can have your guests on their feet the whole night having an unforgettable experience. Do you need a live band? Will the children need to be entertained by a balloon artist? We can help you answer these questions and more. Our experts have worked with countless entertainers in our area, from DJs to magicians, and can provide you with a list of trusted referrals. You can be assured that Livingston Caterers provides only first class talent with a proven track record of reliability and professionalism so you can spend time with your guests and enjoy your event. 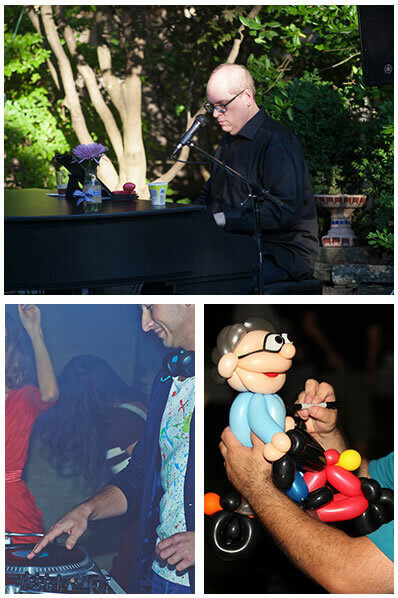 As part of our event planning services, we don’t just book the talent. Prior to your event we will discuss all details such as your song requests or timeline details so all will flow as you envision on your special day. Livingston Caterers will also be responsible for finalizing all confirmations, and handling all communication with the entertainment the day of the event (including a detailed timeline and distribution of final payments or gratuities). Leave it all to us and our expert team. We want you to be able to spend your time with friends and family the day of your big event, as you are not there to entertain them. Copyright © 2017 Livingston Caterers. All Rights Reserved.